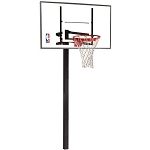 Huffy 8040 Pole Pad - 1 1/2 inch Thick Basketball Accessories. 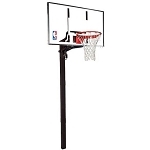 Help protect players against impact into the basketball pole when playing with this Huffy Sports basketball pole pad. This pad also provides a nice look to complete your system. The pad measures 1 1/2 inches thick. It attaches using straps around the back of the pole. This pole pad will fit most poles (3 in. round to 4 in. square). 1 1/2 inch thick foam. Attaches to pole using Velcro straps. Ships directly from Spalding's warehouse. Generally leaves the warehouse within 1-2 business days. Spends about 3-6 business days in transit. Product weighs about 6.5 lbs. Packaging dimensions: 20.47" x 7.48" x 21.46". 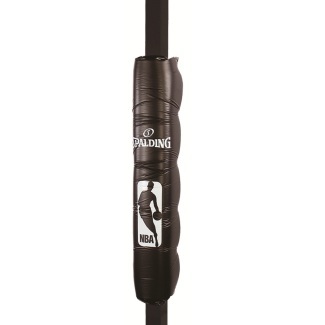 Competitive Edge Products is an authorized dealer of Spalding and Huffy Basketball Accessories Pole Pads. This fit exactly what we were looking for without breaking the bank. Nice product. Well made and should keep the kids from getting hurt if they happen to run into the pole. At this price point, it is better than I expected The kids like it because of the color and the logo printed on it. Q: Is this pad available to order now? website says can be shipped after July 19 and I would like it earlier. thanx for your help. A: The pad waiting to be restocked around that date, and can ship out after that. You are welcome to pre-order if you would like. Fast Shipping: Orders for the Spalding 8040 generally leave the warehouse within 1-2 business days.